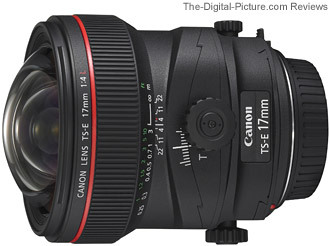 The Canon TS-E 17mm f/4L Tilt-Shift Lens is, at review time, the widest tilt-shift SLR lens made. It is also one of the highest quality (both optically and physically) 17mm lenses made. The Canon TS-E 17mm f/4L Tilt-Shift Lens was introduced at the same time as the Canon TS-E 24mm f/3.5L II Tilt-Shift Lens. Because of their similarities, I am borrowing some of the material/layout/text from the Canon TS-E 24mm f/3.5L II Tilt-Shift Lens review for the Canon TS-E 17mm f/4L Tilt-Shift Lens Review. One of the first things you need to know about the Canon TS-E 17mm f/4L Tilt-Shift Lens is that it, like all tilt-shift lenses, is a MF (Manual Focus)-only lens. If you need AF, this lens is not for you (or you may want two lenses covering 17mm). With that fact in mind, I'll next point out the "TS-E / Tilt-Shift" features of this lens indicated by the title. While these are extremely useful features, it is not a requirement that they be used. And since these features require more in-depth explanation, let's review the non-tilt-shift aspects of this lens first. Please note: There are approximately 10 MB of images included in this review. Please be patient for them all to load. As demonstrated in the sample image below, the Canon TS-E 17mm f/4L Tilt-Shift Lens' movements can be locked at "0" and be used like any other 17mm lens without the additional movements. The New York City image above was captured with the Canon TS-E 17mm f/4L Tilt-Shift Lens and a Canon EOS-1Ds Mark III (f/11, no tilt, no shift, handheld). While not as jaw-droppingly sharp as the Canon TS-E 24mm f/3.5L II Tilt-Shift Lens, the Canon TS-E 17mm f/4L Tilt-Shift Lens is quite sharp wide open in the center. Mid and corner portions of the frame appreciate a somewhat narrowed aperture to bring out their best. The TS-E 17 does not trounce the Canon EF 16-35mm f/2.8L II USM Lens or Canon EF 17-40mm f/4.0L USM Lens (both at 17mm) for sharpness, but the TS-E 17 definitely has some strong advantages. A notable one is that the TS-E 17 L's extreme full frame corners do not turn to mush even wide open at f/4. They stay sharp. Review the top-left 100% crop samples below. Note that, to reduce page load time (especially for mobile users), this comparison is being hosted on a separate page. Click on the image below to open this comparison in a new window/tab. Use Alt-Tab/Ctrl-Tab to toggle back and forth. There was some wind when the above samples were captured - shutter speeds were adequate to stop most of the action, but the trees changed position from shot-to-shot. Another differentiator visible above is the amount of vignetting present in the corner images. The Canon TS-E 17mm f/4L Tilt-Shift Lens controls vignetting very well for a 17mm focal length. Full frame body users are going to notice about 2 stops of darkening in the corners at f/4. Comparing this figure to the 2.5 stops for the even wider aperture Canon EF 16-35mm f/2.8L II USM Lens at f/4 or the 4 stops for the Canon EF 17-40mm f/4.0L USM Lens gives the deserved perspective. The Canon TS-E 17mm f/4L Tilt-Shift Lens controls CA (Chromatic Aberration) extremely well. 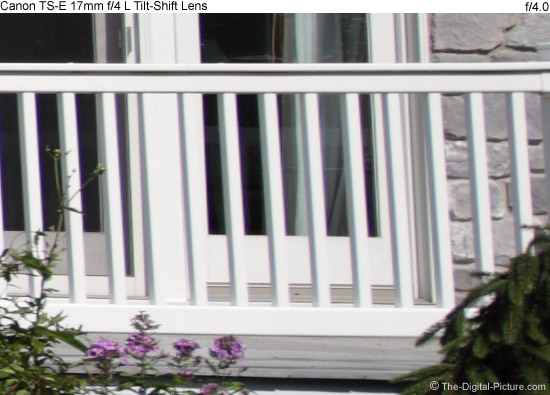 View the example below paying special attention to the red/green CA showing at the edges of the white fence and windows. Click on the image to see a comparison with other lenses (opens in a new window to save your place here). The above-referenced images were processed from Canon EOS 5D Mark II RAW captures using the Neutral Picture Style with sharpening set to "1" (very low). These images are crops from the far right side of the frame - a part of the frame that is seldom as sharp as the center. The plane of sharp focus runs between the fence and the side of the house. The image detail size differences seen above comparison are attributed to a couple of things. First, the TS-E 17mm L frames slightly tighter than the EF 17-40 L and the 16-35mm L II reported 18mm in the EXIF (I was attempting to get 17mm - the results closely match the framing from the TS-E 17 L). The effect of barrel distortion is also showing in the above examples - in the 16-35 II and 17-40 images at least. While the Canon TS-E 17mm f/4L Tilt-Shift Lens does have a small amount of barrel distortion, it has significantly less than either the 16-35 or 17-40 at this focal length. Compare these lenses in the ISO 12233 Chart comparison tool - you will see the details in the top image enlarged in the 16-35 L II 16mm samples and even more enlarged in the 17-40 L 17mm samples. Compare the flare using the site's flare comparison tool. Utilizing SWC (Subwavelength Structure Coating), the Canon TS-E 17mm f/4L Tilt-Shift Lens does a great job controlling flare. So do the other two lenses compared here. If I was forced to declare a winner, the 17-40 L would be it. But the differences between this lens and the TS-E 17 are very small. The 16-35 also performs very well, but shows a little flare at narrower apertures. Contrast and colors are great, and overall, the Canon TS-E 17mm f/4L Tilt-Shift Lens performs very well optically. One TS-E 24mm L II Lens feature that caught my attention was its ability to focus extremely close for its focal length. The TS-E 17 L gives up only 1.5" (40mm) in its minimum focus distance stat, but with its wider focal length, only a mediocre MM (Maximum Magnification) spec is delivered. Remember that minimum focus distances are measured from the sensor plane - subtract the length of the lens + part of the camera body to get the working distance. To increase the MM any significant amount would require a very short working distance - one that would risk damage to that fully-exposed front lens element. Not great, but a .14x MM (Maximum Magnification) will still provide dramatic perspective at 17mm. The Canon TS-E 17mm f/4L Tilt-Shift Lens is not compatible with extension tubes, so the only way to get higher magnification from the Canon TS-E 17mm f/4L Tilt-Shift Lens is through the use of extenders. While the owner's manual advises that the TS-E 17mm L is not compatible with extenders, the with-extender results shown in the ISO 12233 tool are evidence that the combination works. The aperture will not report aperture properly with extenders mounted, but images can be made. 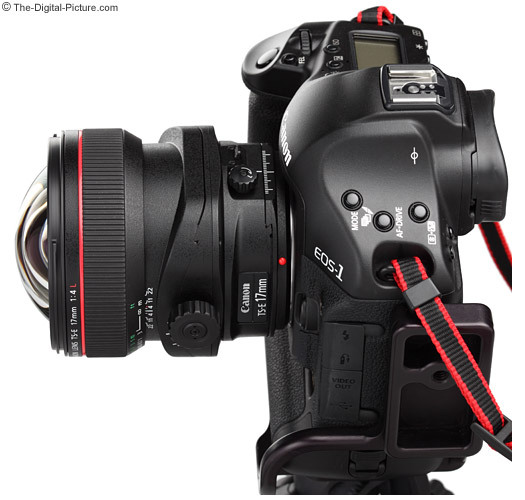 Adding the Canon EF 1.4x II Extender will yield a 23.8mm f/5.6 lens that delivers quite good results. As always, the 1.4x adds barrel distortion and CA. Adding the Canon EF 2x II Extender will yield a 34mm f/8 lens. The 2x extender has a bigger impact on sharpness/contrast than the 1.4x. Here is what the Canon TS-E 17mm f/4L Tilt-Shift Lens looks like mounted on a camera. The camera is the Canon EOS-1Ds Mark III. The lens of course is the Canon TS-E 17mm f/4L Tilt-Shift Lens. And what stands out to me in this image is that amazing front lens element. Sorry - I was getting distracted by how light plays off of that beautiful glass. :) This lens is almost as fun to take pictures of as it is to take pictures with. There is no lens hood available for this lens (Canon recommends using a piece of cardboard to shade the lens). There are no filter threads provided. And I can tell you that extra care is required to keep that bulgeous glass pristine. Strong recommendation: the supplied and very protective lens cap (shown in the product images below) should be in place unless the lens is actively being used. 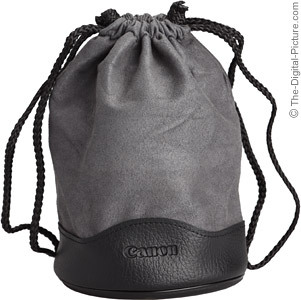 Here is the genuine Canon LP1219 soft lens case the TS-E 17 ships with. It sports the red Canon L Lens ring, so expectations are for great build quality to go with the great image quality and great looks. And in this area, the Canon TS-E 17mm f/4L Tilt-Shift Lens does not disappoint. The easy-to-find and nicely-sized focus ring notably and all other lens movements as well, are very smooth. Build quality is excellent - top of the line. Handling is somewhat marred by the tilt/shift/rotate knobs, but it is still good. This lens will most often be used on a tripod, so the handling aspect is not real important for most owners/renters of this lens. While it is the heavy-weight in this list, Canon TS-E 17mm f/4L Tilt-Shift Lens is not a burden to carry. It is very nicely sized with a solid feel. The TS-E 17 does not extend with focusing and there is no issue with filter size or rotation - they are simply not supported. Update: There are now some options for using filters on the TS-E 17. One very good option is the Lee Filters Adapter Ring for the TS-E 17mm Lens. This adapter allows use of the Lee Filter Foundation Kit and the huge range of filters available for this system. Another option is the Fotodiox WonderPana system that accepts all 145mm filters and with the 66 system holder, 6.6 x 8.5" rectangular filters. Use the mouseover links below to review and compare the Canon TS-E 17mm f/4L Tilt-Shift Lens with the Canon TS-E 24mm f/3.5L II Tilt-Shift Lens. The angle of view and the usable image circle (more later) from the Canon TS-E 17mm f/4L Tilt-Shift Lens are such that a lens hood is not practical - and one is not included. Included is the unique bayonet-mount, wrap-around protective plastic lens cap - with a strap (The manual warns against carrying the lens by the strap - thanks). The TS-E Dance. Let's talk about tilt, shift and rotate - and let's start with a visual look at these movements. Use the mouseover links below to review Canon TS-E 17mm f/4L Tilt-Shift Lens' tilt, shift and rotation movements. Like reading a book work from left to right and top to bottom. 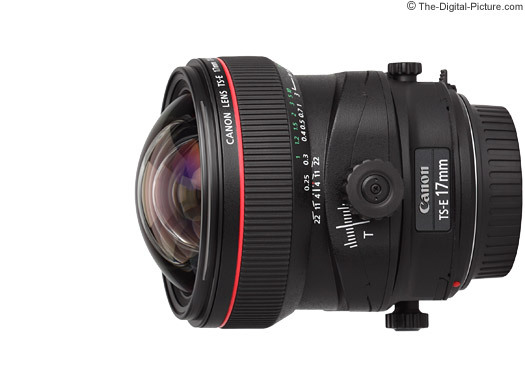 The Canon TS-E 17mm f/4L Tilt-Shift Lens tilts 6.5 degrees in either direction. A locking knob fixes the movement at the position selected by the larger, smooth-functioning, rack and pinion adjustment knob (this knob can be seen turning in the tilt images above). The two locking knobs are always on the opposite side of the lens from their respective main adjustment knob. A switch is provided to lock tilt at "0" (seen in the bottom-right "180" image). 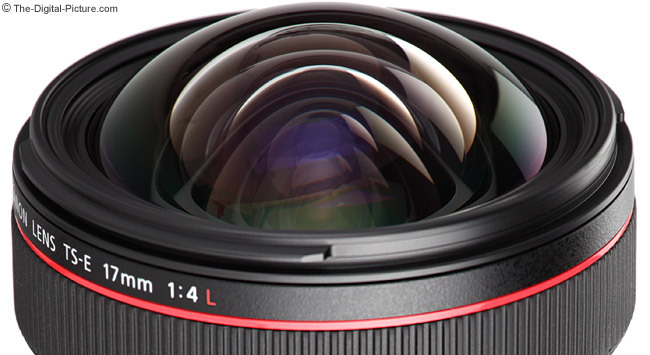 The Canon TS-E 17mm f/4L Tilt-Shift Lens shifts 12mm in either direction. A locking knob fixes the movement at the position selected by the larger smooth-functioning, rack and pinion knob (this knob can be seen turning in the shift images above). A larger shift knob is provided (but not pictured here) for use with Canon EOS DSLR bodies without a built-in flash (1-Series, 5D Series). Even the smaller shift knob is tight under built-in flashes. Like all of the TS-E lenses before it, the entire lens rotates on the lens mount to allow the tilt and shift features to be oriented as desired. The lens rotation will lock at -90, 0 and 90 degrees (180 degree total rotation) and will click (semi-lock) every 30 degrees. The small tab near the lens mount that unlocks the lens rotation is easy to access when holding the camera grip. Caution should be exercised when rotating an already-shifted lens on a camera with a built-in flash. For example, rotating the Canon TS-E 17mm f/4L Tilt-Shift Lens shifted more than 10mm will allow the lens to contact the underside of the flash mount on a Canon EOS 50D. The shift and shift locking knobs become harder to use when they are oriented under the flash. My suggestion is to rotate the lens so that the shift knob is oriented to the bottom. In this orientation, both knobs are quite usable on the 50D. Like no tilt-shift lens before them, the TS-E 24m L II and TS-E 17 L's tilt feature rotates independently of and in relation to the shift movement. This is a really nice feature - its called TS rotation. In the past, the orientation of the shift and tilt mechanisms could be changed in relation to each other, but it meant taking the lens apart with a screwdriver (or sending it to Canon Service if you were less adventurous). And even then, the movement orientation options available were either perpendicular (right angle) or parallel to each other (2 options). Now, rotation of the tilt and shift features can be adjusted independently of each other. The tilt-shift relationship can be changed by varying amounts up to 90 degrees on the fly. TS rotation locks at the parallel or perpendicular settings relative to the shift orientation and clicks at 45 degrees. You can use non-click settings for either rotation mechanism on this lens, but care must be taken to maintain that setting (no lock is provided for the 'tweener positions). The small tab near the shift locking knob (closest to the lens mount) unlocks the TS rotation. Tilt. As you can see in the product images above, tilting angles the end of the lens relative to the camera's sensor - the two are essentially no longer parallel to each other. 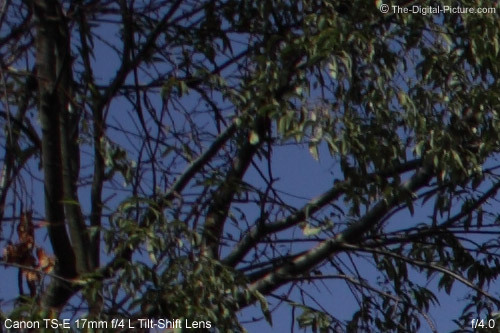 The plane of sharp focus is tilted in the same direction the lens is tilted. Here is a tilt example. All of the shots in the following comparison were taken from a fixed tripod-based camera position. The orange flower is the focused-on subject. Watch the plane of sharp focus move around, especially in the background and foreground, in these f/4 examples. Use the tilt movement to either 1) get more of the image in focus or 2) get less of the image in focus. 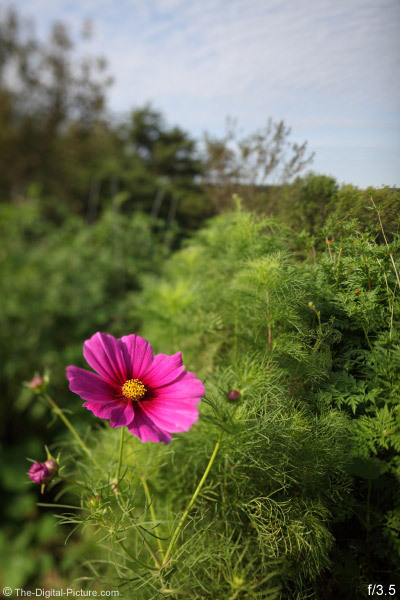 Here is an example of using the tilt function to get more of the image in focus. 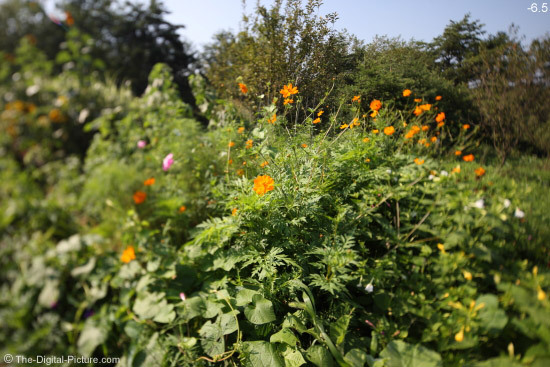 Note: The following example is borrowed from the Canon TS-E 24mm f/3.5L II Tilt-Shift Lens Review - the TS-E 17mm L tilt functionality works similarly - the point being made is the same. Without tilt, even f/11 (remember: narrow aperture = high aperture setting number = deep DOF) renders the flower in the background OOF (Out of Focus). Rotating the Canon TS-E 17mm f/4L Tilt-Shift Lens so that an approximately 45 degrees down/left (or 225 degrees) tilt direction can be obtained and with the lens tilted a small number of degrees, the background flower becomes sharp. Very sharp. The "Bee" and "Distant Flower" mouseover options show this. 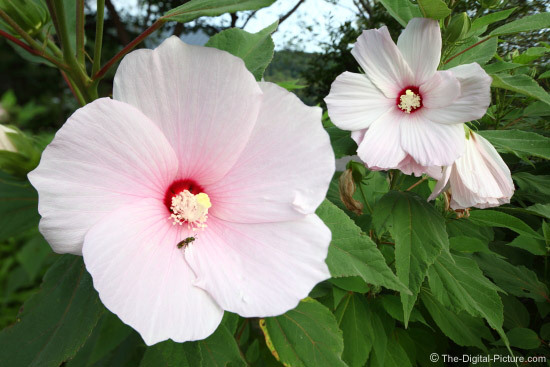 With tilt, both Hibiscus flowers (their centers at least) can remain sharp even at f/3.5 (last example). I used a tilt movement to tilt the plane of sharp focus so that it intersected both of my subjects. 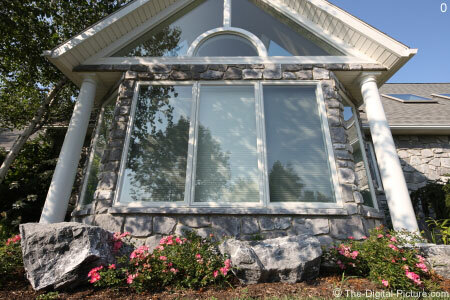 A downward tilt is commonly used in landscape photography - a primary use for this lens. This movement is used to keep all of the low-to-the-ground foreground and the distant background in focus at the same time without resorting to apertures so narrow that diffraction robs the image of sharpness. Or, this same tilt allows a narrower aperture to be used so that faster, action-stopping shutter speeds can be selected. Tilt also works very well for the opposite effect - selecting only part of the frame to be in focus. Draw your viewer's eye to your subject by using selective focus - Isolate the in-focus subject from the rest of the distracting background. The examples below are intended to show how DOF increases along the plane of sharp focus as the aperture is narrowed - just like in a standard lens. Again note: The following example is borrowed from the Canon TS-E 24mm f/3.5L II Tilt-Shift Lens Review. The TS-E 17mm L tilt DOF changes similarly - the point being made is the same. The TS-E 17mm, with is somewhat narrower aperture and noticeably wider focal length does not create as strong of a tilt-blur as the TS-E 24 L II. But, it does create a strong blur for a 17mm f/4 lens. Use the blur to draw attention to your subject and remove background distractions. Another use for this feature is fake miniaturization. Shoot normal-sized subjects from a reasonable distance with the lens fully tilted up to make the subjects appear miniature toy-sized. For more information on tilt, research the Scheimpflug Principle (Wikipedia). Shift. Shift expands capabilities. Shift opens up possibilities. "Shifting moves the optical axis of the lens in parallel to the center of the imaging plane." (Canon owner's manual) Shifting causes the shifted-to side of the image to be expanded and the shifted-away-from side of the image to be narrowed - changing the perspective. Basically, shift allows you to create an image from one location that appears like you were in another location. Here is a shift example. All of the shots in the following comparison were taken from a fixed, low-to-the-ground tripod position. With the exception of the "Reframed" examples, the camera position was also fixed. While shift can change how we perceive the camera position, it is not the same as being in the perceived camera position. This is because the relationship of the lens to all of the objects in the photo does not change - all maintain their locations. But sometimes this is best. In the above example, my reflection is not seen in the glass in any photo including the -6/-8mm "Vertical Shift, Reframed" images that surround the -7mm shift position that would make the shot appear to be taken from a direct-on position. 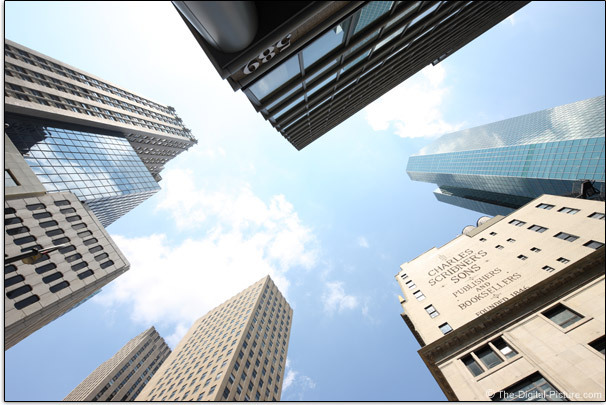 This shot would also eliminate the converging vertical subject lines (from the windows in this case) that what we typically see and capture when looking up or down at our subjects. Rendering lines parallel (as in this referenced image) is perhaps the most-desired shift function. We cannot always shoot our subjects from a straight-on, level/centered position that provides straight vertical (and/or horizontal) lines. It is unrealistic to shoot a 50-story skyscraper from 25 stories up and pointing the camera at the building's eye-level height would mean a great amount of wasted frame on the bottom. But, both methods would give the desired parallel lines. Shooting interior architecture (another use the TS-E is strongly suited for) from a mid-wall height may result in an undesirable framing. 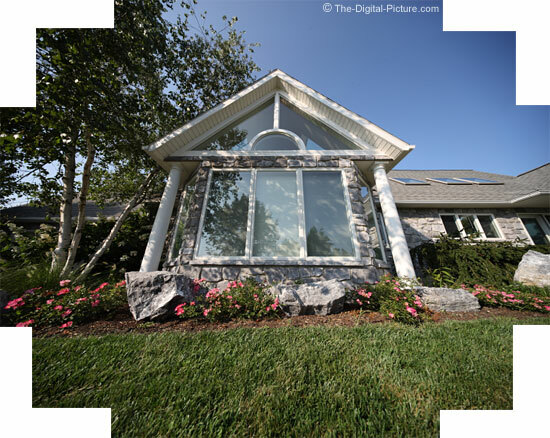 Image editing programs such as Photoshop provide perspective correction functions, but, the image quality is degraded and the final image is no longer a rectangle; and therefore, significant cropping must take place. Shift comes to our rescue. Shoot that skyscraper from the street - keep the sides parallel in the frame. Shooting interior architecture and keep the furniture and cabinet lines straight up and down. Impressive, eh? Photoshop's Auto Align Layers was used to easily piece this panorama example together. Ideally, for this technique to work best, the lens position (not the camera position) should remain constant for these shots - to avoid parallax in foreground objects. There are various means of adjusting the camera the 12 degrees in both side-to-side directions (vertical is more difficult) to accomplish this, but using an Arca-Swiss compatible quick-release clamp and plate make this task relatively easy. Just measure and apply a couple of small indicators on the clamp and plate. Then move the camera the opposite direction of the shift movement - so that the lens remains in its place. Here is another shift example. The following images were taken from the same position. The amount of shift was changed, the same framing was targeted. Shift results are included in the ISO 12233 Chart Tool. Reduced sharpness will be seen in the most-expanded corners of the image when shifting. 12mm shifted results strongly prefer narrow apertures - f/8 and narrower. You can see this in the "S=-12" focal length option in the tool. At f/5.6, 6mm shifted results look very good. Tilt and shift are not hard to use. Check out the "More Reviews & Information" section at the end of this review for more explanations. 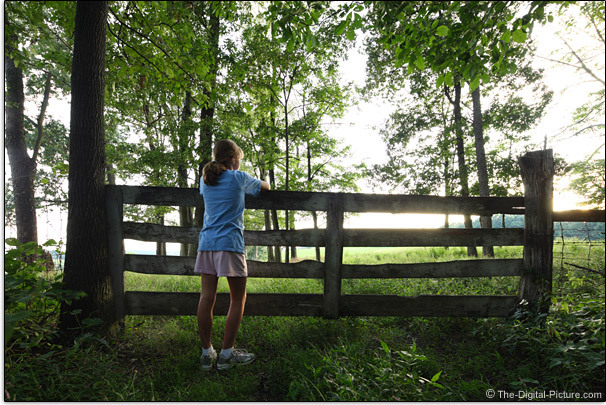 Tilt and/or shift a standard EF lens and you would see significant vignetting. To avoid this, TS-E lenses have a much larger image circle. The TS-E 17mm L has a 67.2mm image circle. This is far larger than the EF lens standard 43.2mm image circle and even larger than the earlier TS-E models' 58.6mm image circle. Even with the larger image circle, tilt and shift movements change the lens' vignetting. Review the vignetting test results for this lens to see the effects first hand. While shift movements cause some minor additional vignetting, tilt movements quickly cause significant vignetting at wider apertures. And full tilt combined with full shift in parallel orientation and an f/4 aperture will result in about 10 stops of darkening in a full frame corner. Don't write off this lens because of vignetting, but use the referenced tool to understand the lens and work around any weak areas. At f/11, very few combinations result in vignetting issues. The referenced vignetting test results are captured using Av AE (Auto Exposure) mode. Along with vignetting, you will notice the widely-varying brightness in the samples for the tilt and shift movements - this happens in real life applications as well. My recommendation is to establish your exposure with both movements set to "0" and setup "M" (Manual) mode for this exposure prior to using tilt and/or shift. Or use Live View's exposure simulation and make your adjustments after setting up the shot. Live View and the Canon TS-E 17mm f/4L Tilt-Shift Lens are best friends. Prior to having Live View, a Canon Angle Finder C was the best focus aid we had available. And the Angle Finder C only showed an somewhat-enlarged image from close to the center of the viewfinder. It worked OK at best. Manual-focus-specific focus screens are designed for faster (wider aperture lenses), so they are not a good option. Live View makes life with the TS-E lenses wonderful. Even for handheld shots - but I recommend a tripod for the best results with the TS-E lenses. Turn on the grid display for assistance in dialing in the right amount of shift. Watch the plane of sharp focus to align on your subject(s) when dialing in the right amount of tilt. Then zoom in to 10x to precisely focus and make any other fine-tuning adjustments needed. While there are many good uses for the Canon TS-E 17mm f/4L Tilt-Shift Lens, landscape and architecture, especially interior architecture, are the most popular uses for this lens. These uses take full advantage of the tilt/shift/rotate movements and typically require the low distortion, low flare and high sharpness this lens delivers. Obviously, APS-C (1.6x FOVCF) bodies frame tighter than their full-frame counterparts. This facts perhaps makes the wide focal length of this lens even more useful for these primary purposes. The Canon TS-E 17mm f/4L Tilt-Shift Lens is also more suited to people photography on an APS-C body. The 27.2mm full-frame-angle-of-view-equivalent focal length is still wide for portraits, but it works well for full body and environmental (subject(s) in their environment) portraits. Tilt is a great technique for isolating your subject from its surroundings. A small downward tilt will help keep all heads in focus in a large group photo. I'm sure the Canon TS-E 17mm f/4L Tilt-Shift Lens will be an invited guest at many weddings. It will see use on full frame bodies for expansive interior/exterior shots and will see use on APS-C bodies for both interiors/exteriors and group photos. Otherwise, if 17mm is the focal length you need and you do not need autofocus, this might be the right lens for your high end image quality needs. While it is a great lens, I do not regard the Canon TS-E 17mm f/4L Tilt-Shift Lens image quality quite as highly as that of the Canon TS-E 24mm f/3.5L II Tilt-Shift Lens. But, you need to make the right focal length selection your top priority. Here is a focal length comparison. The 17mm Panorama example in the above focal length comparison was cropped to the same 3:2 size ratio as the other examples shown. 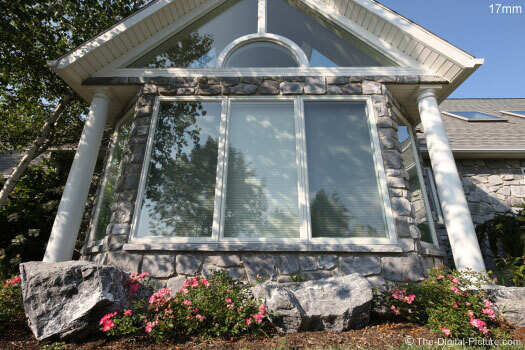 It has plenty of room for expansion vertically or horizontally. The above examples were shot with a full frame DSLR (Canon EOS-1Ds Mark III). Obviously, 17mm provides a significantly different FOV from a 24mm lens. 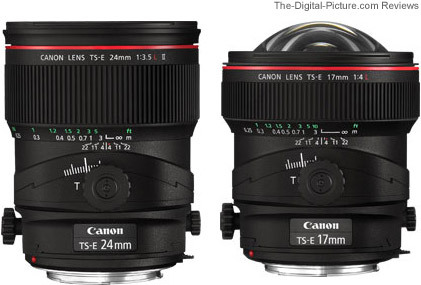 Shown above are the Canon TS-E 24mm f/3.5L II Tilt-Shift Lens (left) and the Canon TS-E 17mm f/4L Tilt-Shift Lens. The price? If you need to ask ... 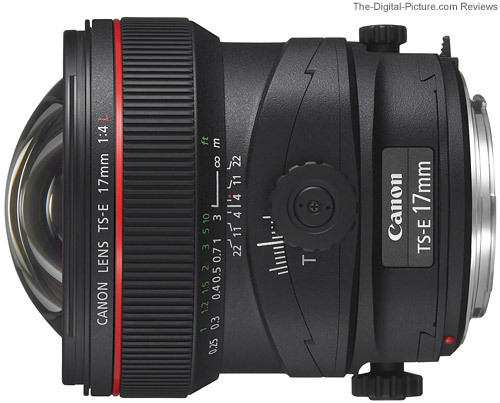 The Canon TS-E 17mm f/4L Tilt-Shift Lens is quite pricey - even pricier than the TS-E 24 L II. So let me help you justify this one. If you are shooting or attempting to shoot professionally, justification will not be hard - this is a lens that can set your work apart. Having your work stand out gets you work which pays for the gear - and more. How about from an educational perspective? A tilt-shift lens can enable you to learn the movements and their affect on images. Like with the TS-E 24mm L II, there is a lifetime of creativity waiting to be unleashed from this lens. It has the capability to set your work apart from the crowd. 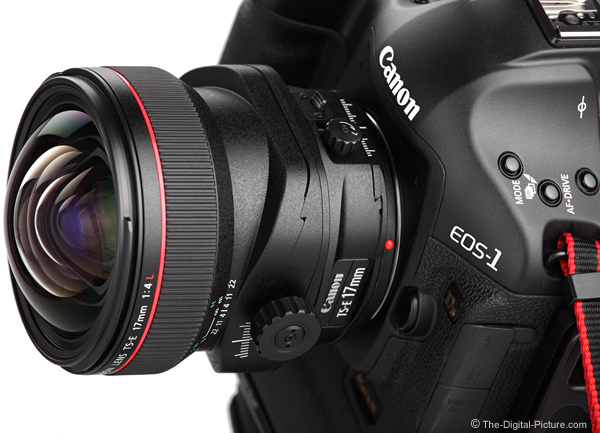 The Canon TS-E 17mm f/4L Tilt-Shift Lens may be a great addition to your kit.